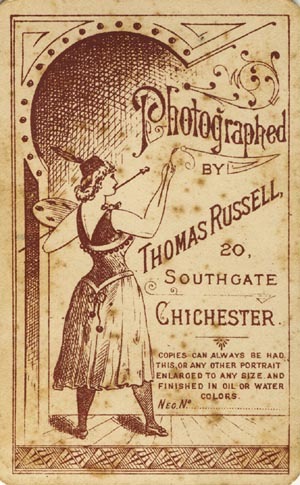 [ABOVE] The design on the reverse of a carte-de-visite produced by Thomas Russell of 20 Southgate, Chichester (c1894). 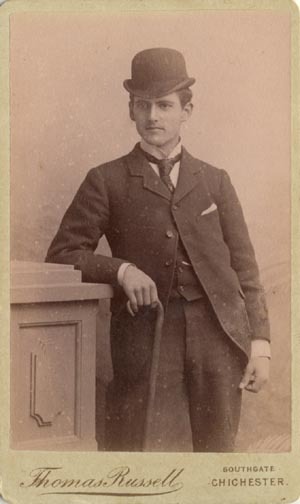 [ABOVE] A carte-de-visite portrait of an unknown man by Thomas Russell of Southgate, Chichester (c1890). 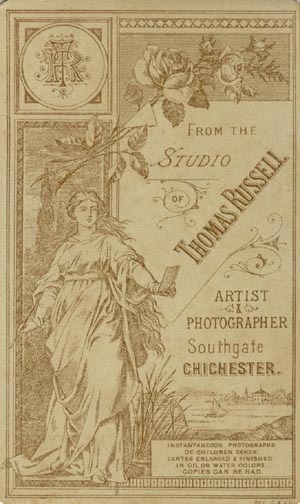 [ABOVE] The design on the reverse of a carte-de-visite produced by Thomas Russell of Southgate, Chichester (c1890). [ABOVE] A carte-de-visite portrait of an unknown woman by Thomas Russell of Southgate, Chichester (c1890). 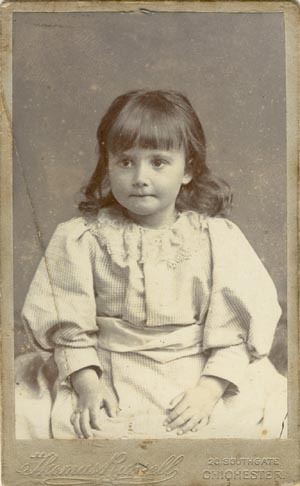 [ABOVE] A carte-de-visite portrait of a young girl by Thomas Russell of 20 Southgate, Chichester (c1900). 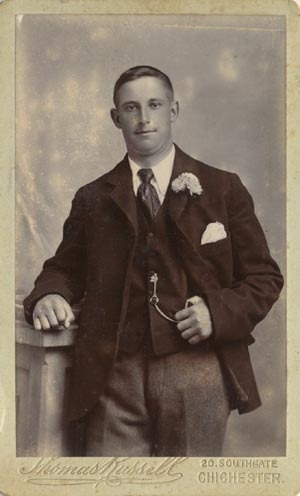 [ABOVE] A carte-de-visite portrait of an unknown man by Thomas Russell of 20 Southgate, Chichester (c1900). [ABOVE] A carte-de-visite portrait of an unknown woman by Thomas Russell of 20 Southgate, Chichester (c1900). 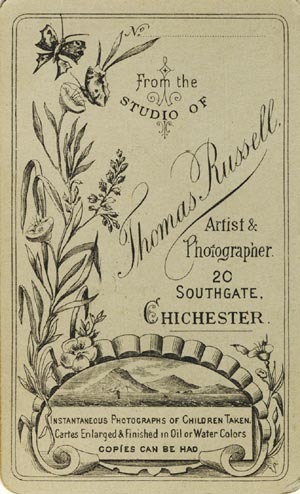 [ABOVE] The design on the reverse of a carte-de-visite produced by Thomas Russell of 20 Southgate, Chichester (c1895). 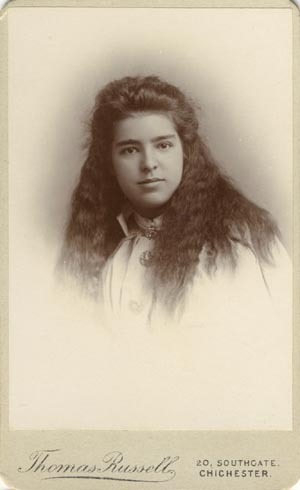 [ABOVE] A carte-de-visite portrait of a young woman by Thomas Russell of 20 Southgate, Chichester (c1898). 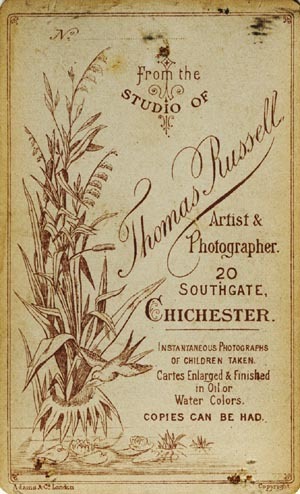 [ABOVE] The design on the reverse of a carte-de-visite produced by Thomas Russell of 20 Southgate, Chichester (c1898). 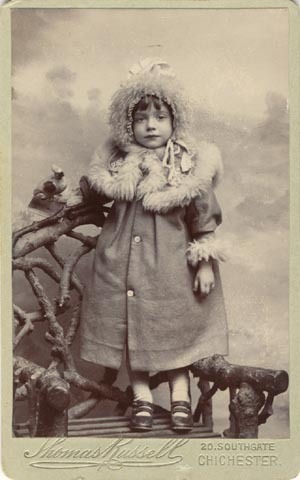 [ABOVE] A carte-de-visite portrait of a young girl by Thomas Russell of 20 Southgate, Chichester (c1900). [ABOVE] A carte-de-visite portrait of an unknown woman by Thomas Russell of 20 Southgate, Chichester (c1900). 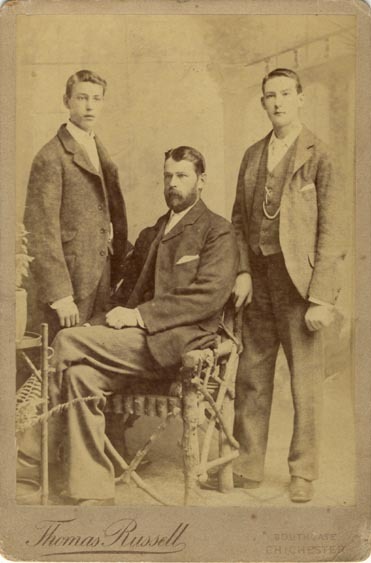 [ABOVE] A cabinet portrait of Mark King and his two sons Reginald and Harold by Thomas Russell of Southgate, Chichester (c1895). Mark King was born in Chichester in 1857 and worked as a Railway Signalman. In 1877 Mark King married Sarah Jane Steele (born c1853, Edburton). 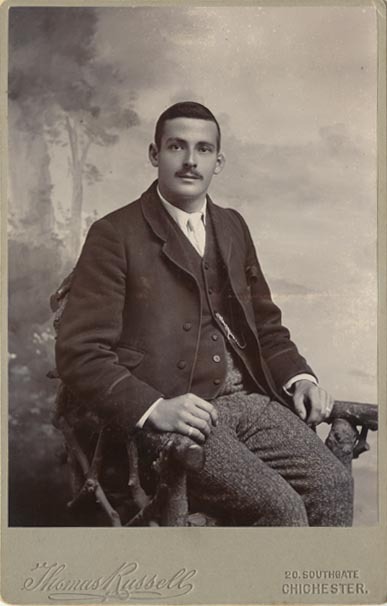 Reginald King was born in 1878 and his younger brother Harold William King was born the following year in 1879. 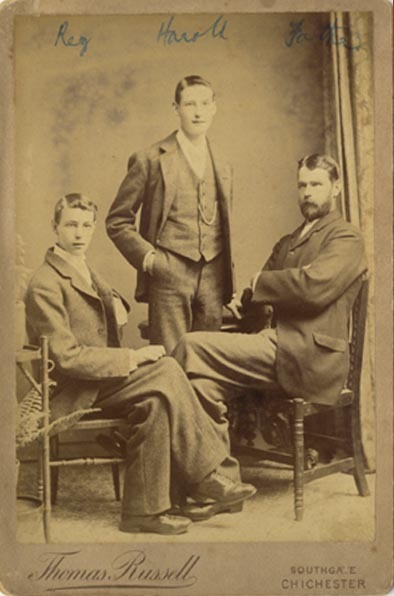 Both sons worked for the Railways, Reginald as a Booking Clerk and Harold as a Goods Clerk. [ABOVE] A cabinet portrait of an unknown man by Thomas Russell of 20 Southgate, Chichester (c1900). Louisa Upfield was born in West Marden, West Sussex, in 1871, the daughter of Ellen Daniels and Thomas Upfield, an agricultural labourer. Thomas Upfield (born c1836) had grown up in the West Sussex parish of Harting. On 18th July 1866, Thomas Upfield married 25 year old house servant Ellen Daniels (born 1841) the daughter of Ann and Charles Daniels, a farm labourer from Stoughton, West Sussex. The union of Ellen Daniels and Thomas Upfield produced at least 8 children. 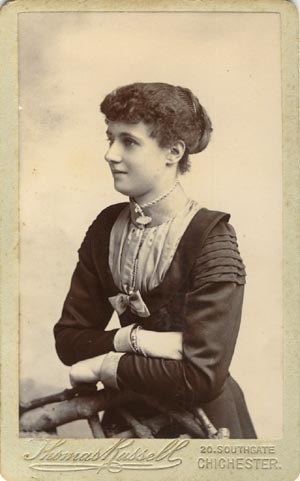 Louisa Upfield was the fourth child and third daughter from this marriage. As was common in Victorian England for the daughters of agricultural labourers, on leaving school, Louisa and her sisters found employment as domestic servants. At the time of the 1901 census, twenty-nine year old Louisa Upfield was still in domestic service, working as a housemaid in the home of Catherine and Harry Breach, a wine & spirit merchant with a business in Chichester. Louisa had been employed as a domestic servant by Mr & Mrs Breach for at least 10 years. During the 4th Quarter of 1901, in the district of Westhampnett, Louisa married Frederick James Crees (born 1876, Boxgrove,Sussex), the son of Charlotte Arnell and James Crees, a farmer's foreman. At the time of his marriage to Louisa, Frederick Crees was employed as a "Shepherd's Mate" in the Lavant area of West Sussex. 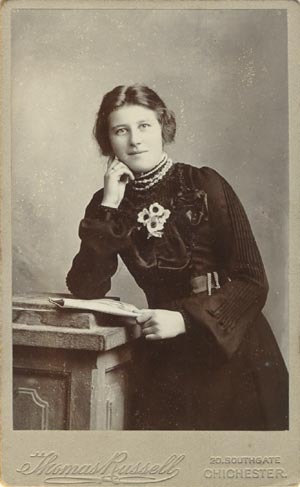 Mrs Louisa Crees (formerly Upfield) became the mother of six children - Ellen (born 1902, Lavant), Edith (born 1904, Lavant) Olive (born 1907 Lavant), Frederick (born 1909, Old Fishbourne, Sussex), Lillie (born 1911, Old Fishbourne) and Maisie Crees (born 1913, Old Fishbourne). Mrs Louisa Crees (formerly Upfield) died in the Lavant area of Chichester in 1950 at the age of 78. Louisa's husband, Frederick James Crees died in 1962 at the age of 85. 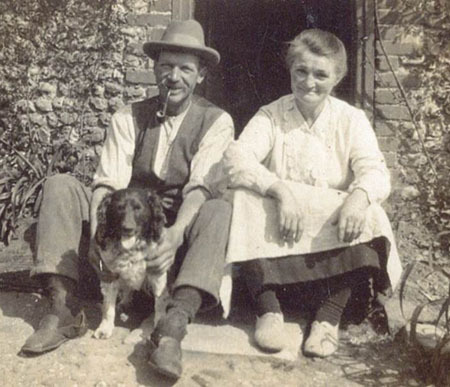 [ABOVE] Mrs Louisa Crees with her husband Fred Crees, a downland shepherd, snapped outside their cottage in 1927. For a number of years Fred Crees worked as a farmer's carter, but from 1913 until his retirement he worked as a shepherd for George Mortimer, who farmed in the Lavant area of West Sussex. [ABOVE] A cabinet portrait of Louisa Upfield by Thomas Russell of 20 Southgate, Chichester (c1896). Louisa Upfield was born in the West Sussex hamlet of West Marden in 1871. 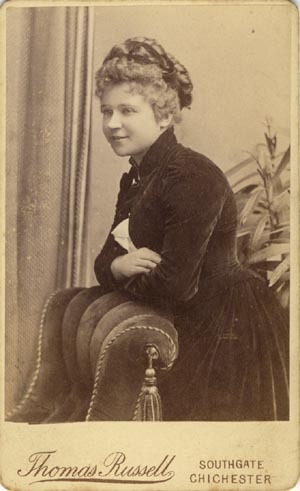 This photograph was taken around 1896, when Louisa was employed as a housemaid by Harry Breach, a wine & spirit merchant who resided in in Chichester. For over a decade, Louisa Upfield was employed as a domestic servant by Catherine and Harry Breach at their home in Chichester. In 1891, nineteen year old Louisa was working as a general servant at Harry Breach's house in Market Road. At the time of the 1901 census, Louisa was recorded as a 29 year old "Housemaid" residing with the Breach family at their residence at No.1, Cawley Road, Chichester. In 1901, Louisa Upfield married Frederick James Crees (1876, Boxgrove, Sussex) and eventually settled in Lavant, West Sussex, where her husband worked as a farmer's carter and a shepherd. A special thank you to Barry Garside Fogden who supplied the cabinet portrait of Louisa Upfield (later Mrs Louisa Crees) and the photograph of Mrs Louisa Crees and her husband Frederick Crees, plus some very useful family history information concerning Louisa and Fred Crees. 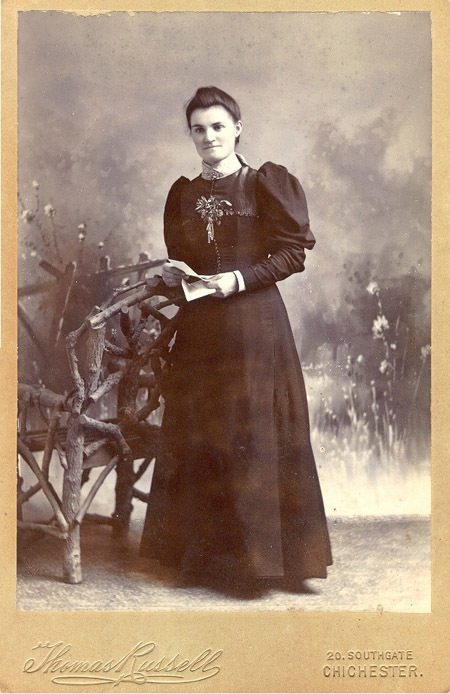 Mrs Louisa Crees was Barry's grandmother. Barry's mother was Maisie Kathleen Crees (1913-1999), Fred and Louisa Crees' youngest daughter.